Sunseeker Cannes is delighted to present to you our summer favourite Eat, Drink, Sleep locations from bespoke travel company Winged Boots. Winged Boots continue to build impressive relationships with the world’s finest hotel, cruise lines and airlines offering the best experiences and most bespoke holidays. Located in one of the city’s top hotels, the Hotel Martinez, La Palme d’Or provides an exquisite dining experience in a spectacular setting. With an art-deco interior adorned with glamourous photos of movie icons and a large terrace overlooking the Mediterranean Sea, don’t be surprised if you spot the occasional celebrity dining here. Headed by world-renowned chef Christian Sinicropi, this two Michelin star restaurant takes you on a sensory experience of creative flavours and pure culinary genius. Expertly curated menus offer an array of intriguing dishes which are cleverly described in a poetical manner. La Palme d’Or is more than a restaurant, it’s a dining experience which embraces the theatrical heart of Cannes. Despite its location away from Cannes’ most famous nightspot, Carré d’Or (golden square), Le Baoli is without a doubt one of the city’s most premier bars. A favourite amongst the Cannes party elite, Le Baoli is lavishly decorated with a rich Asian aesthetic and guests enter through Balinese temple-like doors into an opulent haven of velvet sofas, deeps purples and pink lighting. Le Baoli features its very own ‘Garden of Eden’ surrounded by tropical palm trees where guests can party from midnight to the early hours. Expert mixologists stand by to create a variety of premium cocktails and champagne can be bought by the glass or by the bottle. Located on the famous Boulevard de la Croisette, the Hotel Majestic Barrière provides guests with an elegant and sophisticated retreat overlooking the heart of the city and the beautiful Mediterranean Sea. Contemporary interiors are finished with superb attention to detail and each charming room features all the modern conveniences you’d expect to find in a top hotel. As well as its prime location and exceptional style, the Hotel Majestic Barrière offers a number of fantastic facilities for guests to enjoy, such as a heated outdoor pool, private screening room and secluded beach on the Croisette. 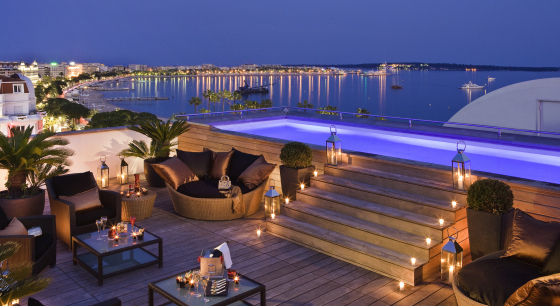 With four outstanding restaurants serving a selection of gourmet dishes and three stylish bars offering premium wines, cocktails and spirits, guests can experience fine-dining in true Cannes style at the Hotel Majestic Barrière. Established in 2009, Winged Boots are a bespoke travel company specialising in tailor-made holidays to the world’s finest destinations. By building strong relationships with some of the most luxurious hotels and leading airlines across the globe, Winged Boots offer customers only the most exceptional accommodation and unique experiences topped off with Premium, First and Business Class travel services. For further information, visit www.wingedboots.co.uk or telephone + 44 (0) 203 816 0985 for the latest offers and travel destination recommendations!